Sign up and receive money-saving offers and tips to help manage your asthma. 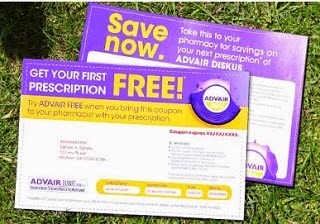 You may be eligible for a coupon to help reduce the cost of ADVAIR. Then, simply take the coupon and your prescription to your pharmacy. This program is only available to residents of the United States and US territories, where specified. Individuals who are enrolled in a government program and/or eligible for Medicare are not eligible for savings offers. If your insurance changes, you may no longer be eligible to use this coupon. Offer limited to one coupon per person per purchase. Click for more medicine savings! Requested Oct 14 because I use Advair for my asthma, and had it sent to my in-laws summer home in Florida.